Best Damavand Climbing Season is Mid June to mid September. In this time the footpaths are usually free of snow and the Damavand Weather is generally good. Recommended timing for climbing Damawand is 15 June to to 15 September and the best season for Damavand Ski Touring is from November to April. In June, July and August usually the footpaths are free of snow and the weather is fair, the south route basecamp is accessible by car. Mountaineers with the ordinary trekking skill are advised to tackle the mountain only during this period. Damavand Crowd is the only disadvantage during summer season. - Even during summer, at night the summit temperatures may drops to -25C. - Due to extreme wind and bad weather conditions, snow, ice and other risks, only experienced climbers should consider the off season ascent. Read more in Damavand Winter Warning. Due to mountain crowd, it is highly recommended to avoid climbing in Iranian Holidays and weekends. Iranian weekend are Thursday and Friday. 1 - The only access road to the mountain is by Haraz Road, during weekends and holidays, there are big traffic jams on this road. 2 - When it is crowded, never sleep in Camp3 Bargah Sevom old refuge, use your own tent or book private rooms in the Camp3 New Hut. 3 - In summer time, do not use Damavand Camp2 Base at all, you better ignore this campsite for any acclimatization and accommodation. It is the worst campsite in area, it is very crowded and too dirty, in fact it is invaded by tour buses and cars which arrive there any time and make a lot of noise and pollution. For better acclimatization only use Camp1 Polour Hut or Camp3 New Hut. 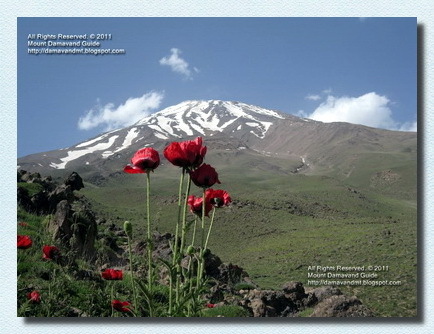 Damavand ordinary and advanced trekking and mountaineering tours 2012. Winter guided tour climbing, ski and snowboard. Mountain guide Iran. Damavand Trekking Time - Damavand Tour. When to Climb Mount Damavand Iran. damavand trekking time, damavand tour, when to climb mount damavand iran, damavand timing, damawand time, damavand ski touring season, damawand hiking period, damavand trek summer time, damawand adventure tour, damavand travel, iran best climbing season, iran mountain trekking tour timing. Climbing tour 2015 Damavand Iran, winter climb and ski mountaineering tours. Outdoor tour organization hiking & trekking. Travel wildlife zones, wildlife protected areas, nomads tours Persia. Natural attractions of Iran, ecosystem, fauna and flora. Iran nature hiking & trekking tours. Persia adventure tour organizer. Guided tour Iran 2015. Weather forecast, meteo information for ski expedition and adventure tours. Leading Damavand and Iran climbing tour organizer. Ski touring, mountaineering and snowboard adventure tour. Tour 2015 ecosystem, fauna and flora and natural attractions. Canyon, valley, island, lake, river, salt lake, swamp, waterfall, wetland tours.Hiking trekking and climbing Damawand. Guided ski and snowboard expedition. Trekking ecosystem, outdoor tourism activity, hiking historical and cultural sites of Persia. Climbing tours to Mt Demavand Iran. Iran cultural and historical tours. Demawand winter guided tour. Trekking and walking. Saturday is the recommended day to start . Damavand is a popular destination for Iranian mountain lovers, mainly because of its great height and none technical moderate climbing slopes, also this summit has gained its popularity quickly among foreign mountaineers recently, so it is visited by a large number of climbers each summer. Due to its easy accessibility from the capital city Tehran and the excellent mountain huts, the south route is the most popular side of the mountain. In order to encounter the least and smallest crowds, we suggest you to start your program Saturday to Monday. The peak season for climbing Damawand is 20 June to 23 Sep and the peak of the peak is reached about 6 August. In order to encounter the least crowd problem, keep away from weekends and holidays, Iranian weekends are Thursday and Friday, start your program on Sunday and finish it before the weekend. Führende Damavand und Iran Klettern Reiseveranstalter. Skitouren, Bergsteigen und Snowboard-Abenteuer-Tour. Tour 2015 Ökosystem, Flora und Fauna und natürlichen Sehenswürdigkeiten. Canyon, das Tal, Insel, See-, Fluss-, Salz-See, Sumpf, Wasserfall, Feuchtgebiet tours.Hiking Trekking und Klettern Damawand. Geführte Ski-und Snowboard-Expedition. Trekking Ökosystem, Outdoor-Tourismus-Aktivität, Wandern historischen und kulturellen Sehenswürdigkeiten von Persien. Klettertouren auf Mt Demavand Iran. Iran kulturelle und historische Touren. Demawand Winter Führung. Trekking-und Wandertouren. Leader Damavand e Iran organizzatore scalata. Sci alpinismo, alpinismo e avventura di snowboard. Tour 2015 ecosistema, la fauna e la flora e attrazioni naturali. Canyon, valle, isola, lago, fiume, lago salato, palude, cascata, tours.Hiking zona umida trekking e arrampicata Damawand. Guidate di sci e di snowboard spedizione. Trekking ecosistema, attività all'aria aperta turismo, escursionismo siti storici e culturali della Persia. Arrampicata visite al Monte Demavand Iran. Iran culturali e itinerari storici. Demawand inverno visita guidata. Trekking ed escursioni. Ledende Damavand og Iran klatring tur arrangør. Skiturer, fjellklatring og snowboard opplevelsestur. Tour 2015 økosystem, fauna og flora og naturattraksjoner. Canyon, dal, øy, innsjø, elv, salt innsjø, myr, foss, våtmark tours.Hiking trekking og klatring Damawand. Guidet ski og snowboard ekspedisjon. Trekking økosystem, utendørs turisme aktivitet, fotturer historiske og kulturelle stedene i Persia. Klatreturer til Mt Demavand Iran. Iran kulturelle og historiske turer. Demawand vinter omvisning. Ведущие Дамаванд и Иран восхождение организатор тура. Лыжные прогулки, альпинизм и сноуборд тура приключений. Тур 2015 экосистемы, фауны и флоры и природных достопримечательностей. Каньон, долина, остров, озеро, река, соленое озеро, болото, водопад, водно-болотных угодий tours.Hiking походы и восхождения Damawand. Прогулки на лыжах и сноуборде экспедиции. Поход экосистемы, активный отдых, пеший туризм памятников истории и культуры Персии. Восхождение на гору туры Demavand Ирана. Иран культурные и исторические туры. Demawand зимний экскурсионный маршрут. Damavand Irán y líder organizador de viajes de escalada. Esquí de montaña, montañismo y turismo de aventura snowboard. Gira 2015 del ecosistema, la fauna y la flora y atractivos naturales. Cañón, valle, isla, lago, río, lago de agua salada, pantanos, cascadas, humedales tours.Hiking trekking y escalada Damawand. Guiado de esquí y snowboard expedición. Trekking ecosistema, la actividad de turismo activo, senderismo lugares de interés histórico y cultural de Persia. Escalada excursiones al monte Demavand Irán. Irán cultural y recorridos históricos. Demawand invierno visita guiada. Trekking y excursiones.